His Eminence, the Most Reverend Job (Osacky) of Chicago was a diocesan bishop of the Orthodox Church in America's Diocese of the Midwest. His territory included Illinois, Indiana, Iowa, Kansas, Michigan, Minnesota, Missouri, North Dakota, Nebraska, Ohio, and Wisconsin. Archbishop Job was born Richard John Osacky in Chicago on March 18, 1946. Saints Peter and Paul Church, at 53rd Street and Western Avenue, was his home parish. He completed university studies at Northern Illinois University and, after graduating from Saint Tikhon Seminary (South Canaan, Pennsylvania) in 1970, he served as cantor and youth director at Saint John the Baptist Church in Black Lick, Pennsylvania. He assumed responsibilities in leading Divine Services in the prescribed manner for readers, conducting religious education and youth work, and painting icons. It was his extraordinary affinity with Orthodox youth that gained him the recognition of the Church at large. In 1973 Reader John was ordained to the holy diaconate and consequently to the holy priesthood by (then) Bishop Theodosius of Pittsburgh. He was assigned to the parish in Black Lick, where he also served as spiritual director for the Orthodox Christian Fellowship at nearby Indiana University of Pennsylvania. As a celibate priest, he maintained a zeal for the monastic life in all his endeavors. In 1975 he was blessed a riasaphor monk, and later was tonsured a monk in the Lesser Schema by (then) Bishop Herman in August of 1982. In November of that year he was elevated to the rank of archimandrite. Recognizing that zeal and spirit of dedication to Church service in Fr. Job, the Diocese of New England nominated the young priest-monk as their diocesan bishop. 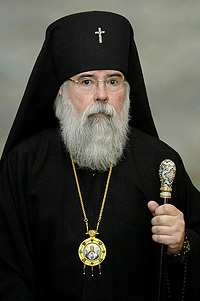 The Holy Synod of the Orthodox Church in America ratified the nomination and elected him Bishop of Hartford and the Diocese of New England. He was consecrated to the episcopacy on January 29, 1983, at All Saints Church in Hartford, Connecticut. In his more than ten years in the See of Chicago, the Diocese of the Midwest experienced tremendous growth. This is witnessed in—but certainly not limited to—the establishment of numerous new mission parishes in the diocese. In addition to his regular duties as the ruling hierarch of the vast Diocese of the Midwest—duties that took him from North Dakota to the western border of Pennsylvania—His Eminence continued to enjoy his long-standing and excellent reputation as an iconographer and an authority in the field. He was often called upon to offer lectures on this subject, and was always willing to assist and encourage other iconographers. Besides this, he arranged and wrote music for the Church, and in his final years, put together & directed the St. Alexis Male Choir, a group focused on singing Carpatho-Rusyn Sacred Chant (Cerkovnoje Prostopinije). In recognition of his more than twenty years of “good and faithful" service as archpastor, at the March 2004 session of the Holy Synod, Bp. Job was elevated to the rank of archbishop. Abp. Job unexpectedly reposed in the Lord on the morning of Friday, December 18, from a bad case of walking pneumonia, at a hotel in Maumee, Ohio. He is buried behind the altar of St. John the Baptist Orthodox Church in Black Lick, PA. The Holy Synod of Bishops, at a brief meeting held in Chicago on December 23, 2009, after funeral services for His Eminence, the late Archbishop Job of Chicago, declared the Chicago See vacant. Members of the Holy Synod appointed His Beatitude, Metropolitan Jonah, as Locum Tenens of the Diocese of the Midwest. This page was last edited on September 29, 2015, at 04:33.